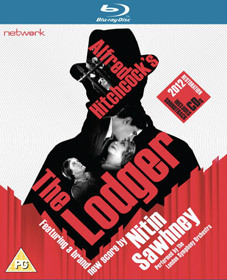 Alfred Hitchcock's first thriller and one of his most celebrated silent films, The Lodger: The Story of the London Fog was made in 1926 and written by Eliot Stannard. It stars matinee heartthrob Ivor Novello as a mysterious lodger suspected of being a serial-killer, the Avenger, who has a taste for young blondes. He rents a room at Mr and Mrs Browning's whose daughter happens to be dating the detective investigating the murders. Made for the then newly created Gainsborough Studios, The Lodger was heavily influenced by the German expressionist movement and films such as The Cabinet of Doctor Caligari and Nosferatu. Its stylised angular shots and the heavy use of light and shadow to convey the mental states of the characters in the film draw inspiration from this school. "I always hoped to follow in the footsteps of the great Hitchcock composer, Bernard Hermann. He has been one of my major heroes and influences since I was a kid. What I find amusing is that, since I am scoring a silent Hitchcock film from 1927, Bernard Hermann will now posthumously follow in my footsteps instead! As a long serving judge for the Ivor Novelloawards I was delighted to be scoring the one Hitchcock film that features Ivor Novello himself. A film that has all the earmarks of a genius director making his first foray into the world of suspense, this is a gift to score and I am enjoying the process more than I even imagined. I can't wait to hear the London Symphony Orchestra play it." The Lodger will be released on UK DVD and Blu-ray, its high definition debut, on 24th September 2012 from Network Releasing at the RRP of £19.99 for the DVD and £24.99 for the Blu-ray. Commemorative Booklet by Hitchcock scholar Professor Neil Sinyard.